This article is about the men's team. For the women's team, see India women's national football team. The India national football team represents India in international football and is controlled by the All India Football Federation. Under the global jurisdiction of FIFA and governed in Asia by the AFC, the team is also part of the South Asian Football Federation. The team, which was once considered one of the best teams in Asia, had its golden era during the 1950s and early 1960s. During this period, under the coaching of Syed Abdul Rahim, India won gold during the 1951 and 1962 Asian Games, while finishing fourth during the 1956 Summer Olympics. India has never participated in the FIFA World Cup, although the team did qualify by default for the 1950 World Cup after all other nations in their qualification group withdrew. However, India withdrew prior to the beginning of the tournament. The team has also appeared four times in the Asia's top football competition, the AFC Asian Cup. Their best result in the competition occurred in 1964 when the team finished as runners-up. India also participate in the SAFF Championship, the top regional football competition in South Asia. They have won the tournament seven times since it began in 1993. Despite India not achieving the same results as their golden era, the team has seen a steady resurgence since the beginning of the 21st century. Besides the SAFF Championship triumphs, under the guidance of Bob Houghton, India won the restarted Nehru Cup in 2007 and 2009 while also managing to emerge victorious during the 2008 AFC Challenge Cup. The Challenge Cup victory allowed India to once again qualify for the Asian Cup for the first time in 27 years. The national team's all-time top goalscorer is Sunil Chhetri, with 67 goals. Chhetri is also India's most-capped player, with 105 international appearances. India side that participated in the 1948 Summer Olympics match against France. Football teams consisting of entirely Indian players started to tour Australia, Japan, Indonesia, and Thailand during the late 1930s. After the success of several Indian football clubs abroad, the All India Football Federation (AIFF) was formed in 1937. The national team played their first match as an independent nation in 1948 in the first round of the 1948 Summer Olympics against France. Using mainly barefooted players, India were defeated 2–1 in London. In 1950, India managed to qualify for the 1950 FIFA World Cup, which was scheduled to take place in Brazil. This was due to all their opponents during qualifying withdrawing from the pre-tournament qualifiers. However, India themselves withdrew from the World Cup before the tournament was to begin. The All India Football Federation gave various reasons for the team's withdrawal, including travel costs, lack of practice time, and valuing the Olympics more than the World Cup. Despite the reason given out by the AIFF, many historians and pundits believe India withdrew from the World Cup due to FIFA imposing a rule banning players from playing barefoot. However, according to the then captain of India, Sailen Manna, the story of the team not being allowed to play due to wanting to play barefoot was not true and was just an excuse to cover up the real reasons the AIFF decided not to travel to Brazil. Since then, India has not come close to qualifying for another World Cup. Despite not participating in the World Cup in 1950, the following years after, from 1951 to 1964, are usually considered to be the "golden era" of Indian football. India, coached by Hyderabad City Police head coach Syed Abdul Rahim, became one of the best teams in Asia. In March 1951, Rahim led India to their first ever triumph during the 1951 Asian Games. Hosted in India, the team defeated Iran 1–0 in the gold medal match to gain their first trophy. Sahu Mewalal scored the winning goal for India in that match. The next year India went back to the Olympics but were once again defeated in the first round, this time by Yugoslavia and by a score of 10–1. Upon returning to India, the AIFF made it mandatory for footballers to wear boots. After taking the defeat in Finland, India participated in various minor tournaments, such as the Colombo Cup, which they won three times from 1953 to 1955. In 1954, India returned to the Asian Games as defending champions in Manila. Despite their achievement three years prior, India were unable to go past the group stage as the team finished second in Group C during the tournament, two points behind Indonesia. Two years later, during the 1956 Summer Olympics, India went on to achieve the team's greatest result in a competitive tournament. The team finished in fourth place during the Summer Olympics football tournament, losing the bronze-medal match to Bulgaria 3–0. The tournament is also known for Neville D'Souza's hat-trick against Australia in the quarterfinals. D'Souza's hat-trick was the first hat-trick scored by an Asian in Olympic history. After their good performance during the Summer Olympics, India participated in the 1958 Asian Games in Tokyo. The team once again finished fourth, losing the bronze-medal match to Indonesia 4–1. The next year the team traveled to Malaysia where they took part in the Merdeka Cup and finished as the tournament runners-up. India began the 1960s with 1960 AFC Asian Cup qualifiers. Despite the qualifiers for the West Zone being held in Kochi, India finished last in their qualification group and thus failed to qualify for the tournament. Despite the set-back, India went on to win the gold medal during the Asian Games for the second time in 1962. The team defeated South Korea 2–1 to win their second major championship. Two years later, following their Asian Games triumph, India participated in the 1964 AFC Asian Cup after all the other teams in their qualification group withdrew. Despite their automatic entry into the continental tournament, India managed to finish as the runners-up during the tournament, losing out to the hosts, Israel, by two points. This remains India's best performance in the AFC Asian Cup. India returned to the Asian Games in 1966. Despite their performance two years prior during the AFC Asian Cup, India could not go beyond the group stage as the team finished third, behind Japan and Iran. Four years later, during the 1970 Asian Games, India came back and took third place during the tournament. The team defeated Japan 1–0 during the bronze-medal match. In 1974, India's performance in the Asian Games once again sharply declined as they finished the 1974 edition in last place in their group, losing all three matches, scoring two, and conceding 14 goals in the first round. India then showed steady improvement during the 1978 tournament, finishing second in their group of three. The team were then knocked-out in the next round, finishing last in their group with three defeats from three matches. The 1982 tournament proved to be better for India as the side managed to qualify for the quarter-finals before losing to Saudi Arabia 1–0. In 1984, India managed to qualify for the AFC Asian Cup for the first time since their second place triumph in 1964. During the 1984 tournament, India finished in last place in their five team group in the first round. India's only non-defeat during the tournament came against Iran, a 0–0 draw. Despite India's decline from a major football power in Asia, the team still managed to assert its dominance as the top team in South Asia. India managed to win the football competition of the South Asian Games in 1985 and then again won the gold medal in 1987. The team then began the 1990s by winning the inaugural SAFF Championship in 1993. The team ended the 20th century by winning the SAFF Championship again in 1997 and 1999. Sunil Chhetri celebrating after scoring during the 2008 AFC Challenge Cup. India's first competitive matches of the 21st century were the 2002 FIFA World Cup first round qualifiers. Despite a very bright start, defeating the United Arab Emirates 1–0, drawing Yemen 1–1, as well as two victories over Brunei, including a 5–0 victory in Bangalore, India finished a point away from qualification for the next round. In 2003, India took part in the 2003 SAFF Championship. The team qualified for the semi-finals but fell to Bangladesh 2–1. Later in 2003, India participated in the Afro-Asian Games being held in Hyderabad. Under the coaching of Stephen Constantine, India managed to make it to the final of the tournament after defeating Zimbabwe, a team ranked 85 places above India in the FIFA rankings at the time, 5–3. Despite the major victory, during the gold-medal match India were defeated 1–0 by Uzbekistan U21. Due to this achievement, Constantine was voted as the Asian Football Confederation's Manager of the Month for October 2003. The tournament result also gave India more recognition around the country and around the world. India celebrating after winning the 2008 AFC Challenge Cup. Constantine was replaced by Syed Nayeemuddin in 2005 but the Indian head coach only lasted for a little over a year as India suffered many heavy defeats during the 2007 AFC Asian Cup qualifiers. During this time India were defeated 6–0 by Japan, 3–0 by Saudi Arabia and Yemen respectively at home, and 7–1 away in Jeddah. Former Malmö and China coach Bob Houghton was brought in as head coach in May 2006. Under Houghton, India witnessed massive improvement in their football standing. In August 2007, Houghton won the country the restarted Nehru Cup after India defeated Syria 1–0 in the final. Pappachen Pradeep scored the winning goal for India that match. The next year, Houghton led India during the 2008 AFC Challenge Cup, which was hosted in Hyderabad and Delhi. During the tournament, India breezed through the group stage before defeating Myanmar in the semi-finals. In the final against Tajikistan, India, through a Sunil Chhetri hat-trick, won the match 4–1. The victory not only earned India the championship but it also allowed India to qualify for the 2011 AFC Asian Cup, the nation's first Asian Cup appearance in 27 years. In order to prepare for the Asian Cup, Houghton had the team stay together as a squad for eight months from June 2010 till the start of the tournament, meaning the players would not play for their clubs. India were drawn into Group C for the Asian Cup with Australia, South Korea, and Bahrain. Despite staying together as a team for eight months, India lost all three of their matches during the Asian Cup, including a 4–0 defeat to Australia. Despite the results, India were still praised by fans and pundits for their valiant efforts during the tournament. After participating the 2011 AFC Asian Cup, India's campaign to qualify for the 2015 Asian Cup began in February 2011 with the AFC Challenge Cup qualifiers. Bob Houghton decided to change the makeup of the India squad, replacing many of the aging players from the Asian Cup with some young players from the AIFF development side in the I-League, Indian Arrows. Even with a young side, India managed to qualify for the AFC Challenge Cup. Despite successfully qualifying for the AFC Challenge Cup, the AIFF decided to terminate the contract of Bob Houghton. After having Dempo coach, Armando Colaco, as interim head coach, the AIFF signed Savio Medeira as head coach in October 2011. Despite leading India to another SAFF Championship victory, Medeira led India to their worst performance in the AFC Challenge Cup in March 2012. The team lost all three of their group matches, unable to score a single goal during the tournament. After the tournament, Medeira was replaced as head coach by Dutchman, Wim Koevermans. Koeverman's first job as head coach was the 2012 Nehru Cup. India won their third successive Nehru Cup, defeating Cameroon's B side on penalties. In March 2013, India failed to qualify for the 2014 AFC Challenge Cup and thus also failed to qualify for the 2015 AFC Asian Cup. The team also failed to retain the SAFF Championship, losing 2–0 to Afghanistan in the 2013 final. After more bad results in friendlies, Koevermans resigned as head coach in October 2014. By March 2015, after not playing any matches, India reached their lowest FIFA ranking position of 173. 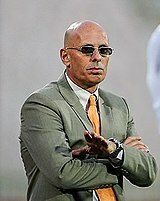 A couple months prior, Stephen Constantine was re-hired as the head coach after first leading India more than a decade before. Constantine's first major assignment back as the India head coach were the 2018 FIFA World Cup qualifiers. After making it through the first round of qualifiers, India crashed out during the second round, losing seven of their eight matches and thus, once again, failed to qualify for the World Cup. Despite failure to qualify for the World Cup, India managed to reach the third round of 2019 AFC Asian Cup qualifiers after defeating Laos in the play-off round on aggregate 7–1. On 11 October 2017, India secured qualification for the 2019 AFC Asian Cup after a 4–1 victory over Macau. Despite being defeated at 2018 SAFF Championship final by 1–2 to Maldives in September 2018, India regained the momentum with some friendlies against China, Jordan and Oman as they began the 2019 AFC Asian Cup with a 4–1 victory against Thailand and is the biggest ever Asia cup win for the team and its first one in 55 years. Nevertheless, they lost both of their next two group matches against UAE and Bahrain by 0−2 and 0−1 respectively and finished at the bottom of the group, thus failed to move to knock out stage. Stephen Constantine immediately resigned from his position as head coach following the failure to progress further in the tournament . India home jersey for 2019 AFC Asian Cup in sky blue and orange tiger stripes on arm. Blue as the national colour for India was soon made more prominent due to the success of the India cricket team and field hockey teams. The football team, however, has used some sort of shade of blue for decades. At the turn of the 21st century, India wore a sky blue shirt with black pants and sky blue socks as their kit. In 2002, the All India Football Federation signed a deal with German manufacturer Adidas to produce the India kit. The first kit made by Adidas was all-white. After four years with Adidas, the AIFF signed an agreement with American company Nike on 27 February 2006. The deal was for seven years. Nike's first kits for India were in darker blue while the away kit was changed from white to orange. For the 2011 AFC Asian Cup, in which India were participating, Nike designed India's kit using the same template it used for other national teams such as Brazil. In January 2013. it was announced that the AIFF's deal with Nike was extended for an extra five years. In September 2017, prior to the India U17 side's participation in the FIFA U-17 World Cup, Nike unveiled an all sky blue kit for the India senior and youth teams. A year later, on 17 December 2018, it was announced that Indian manufacturer Six5Six would replace Nike as India's kit maker. In becoming India's new kit makers, Six5Six also became the first manufacturer to pay for the rights to produce India kits, after both Nike and Adidas didn't pay. Six5Six unveiled their first jersey for the team before the 2019 AFC Asian Cup, with the home colour had a similar sky blue shade and the away colour was changed to white from orange but both the jerseys had unique design embellished on the sleeves representing tiger stripes to pay homage to the Indian football fans, who affectionately calls the team "Blue Tigers"
Numerous venues around India have hosted home matches for the national team. There is no specific home ground for the India national team. India matches have been played at stadiums such as the Salt Lake Stadium at Kolkata, the Jawaharlal Nehru Stadium at Delhi, the Fatorda Stadium at Margao, the Sree Kanteerava Stadium at Bangalore, the Jawaharlal Nehru Stadium at Kochi, the Mumbai Football Arena at Mumbai and the Indira Gandhi Athletic Stadium at Guwahati. In recent times, competitions like 2011 SAFF Championship and 2012 Nehru Cup was held at Jawaharlal Nehru Stadium in Delhi, the 2015 SAFF Championship was held at Trivandrum International Stadium, 2017 Hero Tri-Nation Series and 2018 Intercontinental Cup was held at Mumbai Football Arena and Indira Gandhi Athletic Stadium, Sree Kanteerava Stadium and Fatorda stadium have seen AFC Asian Cup and FIFA World Cup qualifiers. Blue Pilgrims, 2018, displaying tri-colour and their banners. Till the 21st century, the Indian football fans were mostly concentrated and based separately in West Bengal, North-East India, Goa and Kerala. Other than matches in Asian Games, Nehru Cup or SAFF Championship, crowd showed up in fewer numbers in the team's history as the fans were not organised under any single banner as seen in the Europe or South America. Fans of different local clubs used to support the team in their respective venues but were not clubbed together to have a single cause, that of the national team, until 2017 when "Blue Pilgrims" was established as the first organised fan club for the national team. The Blue Pilgrims formed with a motive to support the national team and the U-17 team during the historic 2017 U17 World Cup, India's first ever FIFA competition participation. Started with 300 odd fans, now they are in thousands as a unification of fans from different regions with different allegiances came together for just one cause, the Blue Tigers. They call themselves the devotees of the Blue Tigers, and their motto is to support India national football teams of all gender and age, wherever they play and for such dedication they are called as the 12th man of the team. The 3D Blue Tiger tifo displayed by Blue Pilgrims in June 2018. The Blue pilgrims's most common chants are "Oh when the blues go marching in, I wanna be in that number!" and "Hum honge kaamyab" (We shall overcome). Since its formation, the Blue Pilgrims use to celebrate after every match with Viking clap with the national team members. Fans of the India national team display the country's tricolour national flag and also wear the blue jerseys as to be part of the team, and the Blue Pilgrims use to display the Blue Pilgrims banner along with "Inquilab-e-Indian football" (Revolution of Indian football). On 2 June 2018, then captain Sunil Chhetri posted a video on social media, urging the fan to come out at Mumbai to support the team after a poor crowd appearance of only 2569 at a match against Chinese Taipei in the 2018 Intercontinental Cup where India achieved a massive victory by 5−0, where Chhetri scored a hat-trick but very few people to celebrate with. Responding to captain's call the Blue Pilgrims and football supporters made sure the stadiums remain full in the next matches and on the final of that tournament, the Blue Pilgrims displayed a 30 feet tall 3D tifo of a Blue tiger, the first ever in team's history. Since independence, there have been twenty-nine different head coaches for the India national team, out of which, eleven being foreign coaches. The most successful head coach for India was Syed Abdul Rahim, who led India to gold in both the 1951 and 1962 Asian Games while also achieving a fourth-place finish during the 1956 Summer Olympics. The most successful foreign head coaches for India are Bob Houghton and Stephen Constantine, both of them helped the team to qualify for AFC Asian Cup. With Houghton in charge from 2006 to 2011, India won the Nehru Cup twice and the AFC Challenge Cup in 2008 which allowed India to participate in their first AFC Asian Cup for 27 years. Since, Houghton resigned as India team Head coach in 2011, the Indian national team's FIFA ranking touched its lowest at 173 in the team history in March 2015, but Constantine, who was appointed for the second time as the head coach of India, revived the Indian team from its meagre condition. Under him, the team remained unbeaten for two years from June 2016 to March 2018 winning 11 matches and drawn 2 matches, which helped them to qualify for 2019 AFC Asian Cup after 8 years since Houghton left. He also helped the team to reach a better FIFA ranking of 96 in July 2017, which was best in last 21 years. Syed Abdul Rahim, the most successful Indian coach for the national team. The following 23 players have been called up for the 2019 AFC Asian Cup. Caps and goals are correct as of 14 January 2019[update] after the match against Bahrain. The following footballers were part of a national selection in the past 12 months, but are not part of the current squad. Postal stamp issued in 1998, to honour Gostha Pal. During the early 20th century, India produced one of the best footballers from Asia at that time, Gostha Pal. Pal began playing professional football at the age of 16 in 1911, becoming India's first captain, and was considered one of the best defenders India had ever produced. He was also the first footballer to be awarded Padma Shree in the year 1962 and in 1998, the Government of India introduced a postal stamp in his honour. In the later 1930s, players like Lumsden, Noor Mohammed, Rahim, K.Prosad, A Nandi under the leadership of K.Bhattacharya played for India who scored a total of 56 goals in 17 matches during the 1938 Australia tour out of which 5 matches were against Australia, where Lumsden scored the first international hat-trick for India. Postal stamp issued in 2018, to honour Talimeren Ao. India's first captain after the country gained independence was Talimeren Ao. At a very young age, using footballs made out of rags, Ao gradually improved his skills as a defensive midfielder. He was given the responsibility of leading the team at the 1948 Olympics, India's first major tournament and also was the flag bearer of Indian contingents in London. Also during this era, India produced Sailen Manna, one of the country's best defenders. 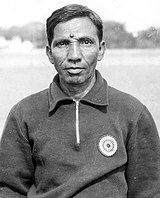 Manna and was given the India captaincy in 1951 during the Asian Games. He led the team to the Gold Medal, India's first major internationally honour. He also captained the team during the 1952 Olympics and 1954 Asian Games. In 1953, England Football Association rated Manna among "10 Best Skippers of the World" in its yearbook., awarded Padma Shri by Government of India in 1971 and AIFF honoured him as "AIFF Player-of-the-Milennium" in 2000. During India's golden era between the 1950s and early 60s, the country produced coveted strikers such as Sheoo Mewalal, Neville D'Souza, Chuni Goswami and Tulsidas Balaram. Mewalal played was India's starting striker during the 1948 Olympics, 1952 Olympics and 1951 Asian games where he ended as the tournament top goalscorer with four goals. Mewalal was the first Indian player to score a hat-trick since the country gained independence when he scored it against Burma during the 1952 Colombo Cup. D'Souza meanwhile became the first Asian player to score a hat-trick at the Olympic Games, scoring a hat-trick against Australia during the 1956 Olympics. D'Souza also tied for top goalscorer in that edition of the Olympics, which helped India reach the semi-finals. Goswami represented India at the 1958 Asian Games and captained the side during the 1962 Asian Games, 1960 Olympics and the 1964 Asian Cup. He was bestowed with Padma Shri by Government of India and AFC honoured him as "Best Striker of Asia" in 1962. During the 1970s to the 2000s, India saw a decline in their results. Despite the lack of tournament victories, the country managed to produce players like Syed Nayeemuddin who led India to bronze at the 1970 Asian Games. During the 1990s, I. M. Vijayan, India's best player at the time, was capped 66 times for India while scoring 29 goals and captaining the team several times. In 1995, Bhaichung Bhutia debuted for India. With Bhutia, India qualified for the AFC Asian Cup after a drought of 27 years. He was the captain of the team for over ten years. Considered one of the greatest footballers of India, he is the second-most-capped player of India with 82 caps and has scored 27 times for India. He was awarded the Padma Shri in 2008 and IFFHS listed him among the legendary players of football in 2016. Under Bhutia's captaincy Sunil Chettri debuted for India who is now the only footballer in India's history to have played 100 international matches and is the all-time highest goal-scorer of India. He has led the national team to many victories, most importantly qualifying for the AFC Asian Cup and under his leadership the team achieved its highest FIFA ranking of 96 after twentyone years. His goal-scoring ability and skills make him the only Indian striker to score three hat-tricks for India. India has never participated in a FIFA World Cup. After gaining independence in 1947, India managed to qualify for the World Cup held in 1950. This was due to Myanmar, Indonesia, and the Philippines withdrawing from qualification. However, prior to the start of the tournament, India themselves withdrew due to the expenses required in getting the team to Brazil. Other reasons cited for why India withdrew include FIFA not allowing Indian players to play in the tournament barefoot and the All India Football Federation not considering the World Cup an important tournament compared to the Olympics. After withdrawing from the 1950 FIFA World Cup, India didn't enter the qualifying rounds of the tournament between 1954 and 1982. Since the 1986 qualifiers, with the exception of the 1990 edition of the tournament, the team started to participate in qualifiers but have yet to qualify for the tournament again. India has qualified for the AFC Asian Cup four times. The team played their first Asian Cup in 1964. The team managed to qualify following other nations refusal to play against India due to political reasons. India managed to finish the tournament as runners-up to hosts Israel, with Inder Singh finishing as joint top-scorer. Since then India has failed to progress beyond the first round of the Asian Cup with their participation at the 1984 and 2011 Asian Cup and the most recent being the 2019 Asian Cup. Talimeren Ao, leading India out at Cricklefield Stadium to play against France. India competed in four straight Olympic football tournaments between 1948 and 1960. Their sole 1948 Olympics match against France was also India's first ever international match since the country gained independence in 1947. During the match, a majority of the Indian side played barefoot. The match ended in a 2–1 defeat, with Sarangapani Raman scoring the lone goal for India. India then returned to the Olympics four years later where they took on Yugoslavia in the preliminary rounds. The team suffered a 10–1 defeat, India's largest margin of defeat, and were knocked out. Four years later, during the 1956 Olympics, India managed to reach the semi-finals and finish fourth. After India's first round opponents, Hungary, withdrew from the tournament, the team played against hosts Australia in the quarter-finals. A Neville D'Souza hat-trick, the first by an Asian footballer in the Olympics, helped India win 4–2. However, in the semi-finals, India once again suffered defeat against Yugoslavia, going down 4–1. In the bronze medal match, India were defeated 3–0 by Bulgaria. In 1960, India competed in Group D with Hungary, France and Peru. India ended the group in last place, drawing once. India have since failed to qualify for another Olympic games. ^ a b "Sunil Chhetri". national-football-teams. ^ "India jump four spots to enter top 150 of FIFA men's rankings". Scroll. TheField Scroll. 3 March 2017. Retrieved 3 March 2017. ^ "India slip to 172 in latest FIFA rankings". IndianExpress. IndianExpress. 3 March 2017. Retrieved 3 March 2017. ^ a b "World Football Elo Ratings: India". World Football Elo Ratings. Retrieved 15 September 2018. ^ a b c d e f "Triumphs and Disasters: The Story of Indian Football, 1889--2000" (PDF). Retrieved 20 October 2011. ^ a b c d Kapadia, Novy (2 July 2013). "The 1950 FIFA World Cup: A missed opportunity for India". SportsKeeda. Retrieved 17 March 2017. ^ "1950 FIFA World Cup Brazil – Overview". FIFA. Archived from the original on 18 March 2012. ^ "Internet Archive Wayback Machine". Web.archive.org. 14 June 2010. Archived from the original on 14 June 2010. Retrieved 20 October 2011. ^ Article written by Somnath Sengupta (26 December 2010). "Legends of Indian Football: Rahim Saab". Thehardtackle.com. Retrieved 20 October 2011. ^ a b Ghoshal, Amoy. "Indian football team at the Asian Games: 1951 New Delhi". SportsKeeda. ^ Arunava Chaudhuri. "The Indian Senior Team at the 1952 Helsinki Olympics". Indianfootball.de. Retrieved 20 October 2011. ^ "Asian Games 1954". RSSSF. ^ a b "Melbourne, 1956". FIFA. ^ Arunava Chaudhuri. "The Indian Senior Team at the 1958 Tokyo Asian Games". Indianfootball.de. Retrieved 20 October 2011. ^ Arunava Chaudhuri. "The Indian Senior Team at the 1959 Merdeka Cup". Indianfootball.de. Retrieved 20 October 2011. ^ Arunava Chaudhuri. "The Indian Senior Team at the 1960 Seoul Asia Cup Qualifiers". Indianfootball.de. Retrieved 20 October 2011. ^ Arunava Chaudhuri. "The Indian Senior Team at the 1962 D'Jakarta Asian Games". Indianfootball.de. Retrieved 20 October 2011. ^ Arunava Chaudhuri. "The Indian Senior Team at the 1964 Tel Aviv Asia Cup". Indianfootball.de. Retrieved 20 October 2011. ^ Arunava Chaudhuri. "The Indian Senior Team at the 1966 Bangkok Asian Games". Indianfootball.de. Retrieved 20 October 2011. ^ Arunava Chaudhuri. "The Indian Senior Team at the 1970 Bangkok Asian Games". Indianfootball.de. Retrieved 20 October 2011. ^ "Asian Games 1974". RSSSF. ^ "Asian Games 1978". RSSSF. ^ "Asian Games 1982". RSSSF. ^ a b Arunava Chaudhuri. "The Indian Senior Team at the 1984 Singapore Asia Cup". Indianfootball.de. Retrieved 20 October 2011. ^ "South Asian Games". IndianFootball.De. ^ a b "SAFF CHAMPIONSHIP: REMEMBERING INDIA'S SAFF TITLE TRIUMPHS". The Hard Tackle. 27 August 2013. Retrieved 17 March 2017. ^ "World Cup qualifying". RSSSF. ^ a b "Constantine's rising stock". IndianFootball.De. Retrieved 17 March 2017. ^ "Uzbekistan win football gold". Rediff. 23 October 2003. Retrieved 17 March 2017. ^ "National football team's coach sacked". Hindustan Times. 9 March 2006. Retrieved 17 March 2017. ^ "AFC Asian Cup 2007". RSSSF. ^ "Bob Houghton is India's football coach". Rediff. 28 May 2006. Retrieved 17 March 2017. ^ "Nehru Cup 2007". RSSSF. ^ "India win AFC Challenge Cup". Rediff.com. 13 August 2008. Retrieved 17 March 2017. ^ Rizvi, Ahmed (7 July 2009). "Houghton prepares in earnest". The National. Retrieved 17 March 2017. ^ "AFC Asian Cup 2011: Group C preview". The World Game. 9 November 2012. Retrieved 17 March 2017. ^ a b "INDIA IN AFC ASIAN CUP 2011: PERFORMANCE REVIEW". The Hard Tackle. 20 January 2011. Retrieved 17 March 2017. ^ Sengupta, Rahul (17 February 2011). "AIFF Announces New Look Indian Squad For The AFC Challenge Cup Qualifiers". Goal.com. Retrieved 17 March 2017. ^ Deb, Debapriya (27 March 2011). "2012 AFC CHALLENGE CUP QUALIFIERS: TEAM INDIA PERFORMANCE REPORT CARD – PART 1". The Hard Tackle. Retrieved 17 March 2017. ^ "Englishman Bob Houghton sacked as Manager of India". Caught OffSide. 24 February 2011. Retrieved 17 March 2017. ^ "Indian Coach Profile – Savio Medeira". WIFA. Retrieved 17 March 2017. ^ De Sousa, Jonathan (15 March 2012). "INDIAN FOOTBALL: AFC CHALLENGE CUP 2012 REVIEW – A LOOK AT THE BLUE TIGERS". The Hard Tackle. Retrieved 17 March 2017. ^ "Wim Koevermans named as new India senior team coach". Goal.com. 15 June 2012. Retrieved 17 March 2017. ^ "India beat Cameroon to win third successive Nehru Cup title". India Today. 2 September 2012. Retrieved 17 March 2017. ^ "India Lose To Myanmar In AFC Challenge Cup Qualifiers". NDTV Sports. 7 March 2013. Retrieved 17 March 2017. ^ Noronha, Anselm (11 September 2013). "Afghanistan are the SAFF Championship 2013 champions, beat India 2-0". Goal.com. Retrieved 17 March 2017. ^ "Indian football team goes down to Palestine; coach Koevermans resigns". Rediff. 7 October 2014. Retrieved 18 March 2017. ^ "India slip to 172 in latest FIFA rankings". Indian Express. 5 November 2015. Retrieved 18 March 2017. ^ "Stephen Constantine appointed Indian men's football head coach". Indian Express. 16 January 2015. Retrieved 18 March 2017. ^ Sequiera, Sean (5 September 2016). "2018 World Cup qualification was never possible for India: Stephen Constantine". Hindustan Times. Retrieved 18 March 2017. ^ "India thrashes Laos". The Hindu. 7 June 2016. Retrieved 22 October 2017. ^ "India qualify for AFC Asian Cup 2019". Goal.com. 11 October 2017. Retrieved 22 October 2017. ^ "SAFF CUP 2018: YOUTHFUL INDIA TO FACE MALDIVES". Sportskeeda. 9 September 2018. Retrieved 6 January 2019. ^ "Group A: Thailand 1-4 India". The AFC.com. 6 January 2019. Retrieved 6 January 2019. ^ "AFC Asian Cup 2019: Thailand 1-4 India, Player Ratings". FOX Sports Asia. 6 January 2019. Retrieved 6 January 2019. ^ "UAE STEAL INDIA'S THUNDER". the-aiff.com. AIFF. Retrieved 14 January 2019. ^ "AFC ASIAN CUP UAE 2019, India vs Bahrain". the-afc.com. AFC. Retrieved 14 January 2019. ^ a b "India Lose to Bahrain, Crash Out of AFC Asian Cup - Highlights and Analysis". newsclick.in. Newsclick. Retrieved 14 January 2019. ^ "Breaking: Indian head coach Stephen Constantine resigns after AFC Asian Cup exit". FOX Sports Asia. 15 January 2019. Retrieved 14 January 2019. ^ a b Bharali, Abhijit (16 September 2018). "The evolution of the Indian football team jersey over the years". SportsKeeda. Retrieved 13 December 2018. ^ a b "The evolution of the Indian football team jersey over the years". SportsKeeda. Retrieved 13 December 2018. ^ a b "Nike to sponsor Indian football team". Hindustan Times. 27 February 2006. Retrieved 13 December 2018. ^ "The evolution of the Indian football team jersey over the years". SportsKeeda. Retrieved 13 December 2018. ^ Sengupta, Rahul (6 September 2010). "Indian National Team: Nike India Introduces 2010 National Team Kit For The Indian Football Team". Goal.com. Retrieved 13 December 2018. ^ Paul, Abhishek (30 January 2013). "Sponsors shy away from Indian national team as contract ends". DailyMail. Retrieved 13 December 2018. ^ "India's New Football Kit Sets Blue Tigers Up to Create History". Nike. 7 September 2017. Retrieved 13 December 2018. ^ a b Laghate, Gaurav (17 December 2018). "Six5Six to replace Nike as Indian football's kit sponsor". Economic Times. Retrieved 20 December 2018. ^ "NEW YEAR, NEW KIT FOR INDIAN FOOTBALL". the-aiff.com. AIFF. Retrieved 19 December 2018. ^ "AFC Asian Cup 2019: India national team kit and price revealed". foxsportsasia.com. Fox Sports. Retrieved 19 December 2018. ^ "2011 SAFF Championship Stadium Guide: New Delhi – Jawaharlal Nehru Stadium". goal.com. goal.com India. Retrieved 16 September 2018. ^ "Sunil Chhetri strikes brace as India beat Malaysia 3-2 in international friendly". jagran.com. Jagran Post. Retrieved 16 September 2018. ^ "India vs Nepal at Indira Gandhi Athletic Stadium, Guwahati". fifa.com. FIFA. Retrieved 17 September 2018. ^ "India vs Iran at Sree Kranteerava Stadium". fifa.com. FIFA. Retrieved 16 September 2018. ^ "FIVE-STAR INDIA EASE PAST CHINESE TAIPEI". the-aiff.com. AIFF. Retrieved 16 September 2018. ^ "India at the SAFF Cup". wifa.in. WIFA. Retrieved 12 January 2019. ^ "India win 2012 Nehru Cup". timesofindia.indiatimes.com. TOI. Retrieved 12 January 2019. ^ "India wins 2015 SAFF Cup: Who said what". sportskeeda.com. Sportskeeda. Retrieved 12 January 2019. ^ "INDIA ARE HERO TRI-NATION FOOTBALL SERIES 2017 CHAMPIONS". the-aiff.com. AIFF. Retrieved 12 January 2019. ^ "OUR PRIMARY TARGET IS TO WIN THE TOURNAMENT: CONSTANTINE". the-aiff.com. AIFF. Retrieved 12 January 2019. ^ "AFC ASIAN CUP UAE 2019". the-afc.com. AFC. Retrieved 12 January 2019. ^ "The experienced duo of Sunil Chhetri and Clifford Miranda were on target as India beat Nepal 2-0 in a comfortable win". goal.com. GOAL. Retrieved 12 January 2019. ^ "Can Indian football make it to the top league?". thehindu.com. The Hindu. Retrieved 8 January 2019. ^ "Fifa World Cup 2018: Which Indian state watches football extravaganza the most?". ibtimes.co.in. IB Times. Retrieved 13 January 2019. ^ "World Cup 2018: Sorry, Bengalis. You are not India's greatest football fans". dailyo.in. Daily O. Retrieved 11 January 2019. ^ "Bend it like Bengal: Every four years, the cup comes home". thehindu.com. The Hindu. Retrieved 13 January 2019. ^ "Kolkata reinstated as the 'Mecca of Indian football'". goal.com. GOAL. Retrieved 11 January 2019. ^ "India win Nehru Cup for the thrd time". the-aiff.com. AIFF. Retrieved 11 January 2019. ^ Basu, Jaydeep (27 August 2007). "Bhaichung leads dazzling display - NEHRU CUP - India demolish Kyrgyzstan 3-0 to make final for first time". Telegraph India. Retrieved 13 December 2018. ^ "SAFF Cup: India beat Afghanistan 2-1 in final to lift title for seventh time". Indian Express. 3 January 2016. Retrieved 13 December 2018. ^ a b c d "About Us-Introduction to BluePilgrims". bluepilgrims.com. Blue Pilgrims. Retrieved 11 January 2019. ^ a b "BLUE TIGERS FIND SUPPORT IN BLUE PILGRIMS". the-aiff.com. AIFF. Retrieved 11 January 2019. ^ a b c "Blue Pilgrims right behind Men in Blues". asianage.com. Asian Age. Retrieved 11 January 2019. ^ a b c "Blue Pilgrims, the 12th man of Indian football". redbull.com. Redbull. Retrieved 11 January 2019. ^ a b "Intercontinental Cup 2018: 5 Things India gained from the Intercontinental Cup". sportskeeda.com. Sportskeeda. Retrieved 11 January 2019. ^ "Watch: Sunil Chhetri leads incredible Viking clap with Indian fans post Thailand AFC Asian Cup win". foxsportsasia.com. Fox Sports Asia. Retrieved 11 January 2019. ^ "Inquilab-e-Indian football". twitter.com/BluePilgrims. Blue Pilgrims. Retrieved 11 January 2019. ^ "Sunil Chhetri's plea to Indian fans marked as Golden Tweet by Twitter India". indiatoday.in. India Today. Retrieved 11 January 2019. ^ a b "Chhetri called and the Indian football fans answered". economictimes.indiatimes.com. Economic Times. Retrieved 11 January 2019. ^ "After Sunil Chhetri's plea, tickets for India game sold out". thehindu.com/. The Hindu. Retrieved 11 January 2019. ^ "Blue Pilgrims plans 3D tifo display for Chhetri and co". sportstar.thehindu.com. The Hindu. Retrieved 11 January 2019. ^ "From a handful to plenty". deccanchronicle.com. Deccan Chronicles. Retrieved 11 January 2019. ^ Mishra, Rishav (6 January 2013). "Indian Football's Golden Age". Quora (Indian Sports). Retrieved 30 May 2016. ^ a b Nandi, Dhirtiman (23 August 2015). "Performance of Foreign Coaches in Indian National Football Team". IndianFootballNetwork. Retrieved 31 May 2016. ^ a b c "How India rose from a historical low". scroll.in. The Scroll. Retrieved 13 October 2018. ^ a b c "FIFA ranking: Indian football team up to 96, achieve best position in 21 years". hindustantimes.com. HindustanTimes. Retrieved 13 October 2018. ^ a b c Kunti, Samindra. "Meet the man responsible for kickstarting a new era in Indian football—again". qz.com. Quartz India. Retrieved 13 October 2018. ^ "Interview with Stephen Constantine". scroll.in. Scroll. Retrieved 13 October 2018. ^ "Indian football team maintain unbeaten streak in International football". sportskeeda.com. Sportskeeda. Retrieved 13 October 2018. ^ "Asian Cup Qualifiers: India's 12-match unbeaten streak ends". business-standard.com. Business Standard. Retrieved 13 October 2018. ^ "India lose 1-2 to Kyrgyzstan, 13-match unbeaten run ends". timesofindia.indiatimes.com. TOI. Retrieved 13 October 2018. ^ a b c Sharma, Bhargab. "Remembering Rahim Saab, the man who put India on the world football map". catchnews.com. Catchnews. Retrieved 22 September 2018. ^ "1953 Rangoon quadrangular cup". indiafootball.de. indiafootball.de. Retrieved 22 September 2018. ^ Ghosal, Amoy. "Indian football team at the Asian Games: 1954 Manila". sportskeeda.com. Sportskeeda. Retrieved 22 September 2018. ^ Chaudhuri, Arunava. "1955 Dhaka quadrangular". indianfootball.de. indiafootball.de. Retrieved 22 September 2018. ^ "The senior National Team at 1958 Asian Games". indiafootball.de. IndiaFootabll. Retrieved 30 September 2018. ^ "The senior National Team at 1961 Madeka". indiafootball.de. IndiaFootabll. Retrieved 30 September 2018. ^ "The senior National Team at 1964 olympic qualifiers". indiafootball.de. IndiaFootabll. Retrieved 30 September 2018. ^ "The senior National Team at 1964 Asian Cup". indiafootball.de. IndiaFootabll. Retrieved 30 September 2018. ^ "The senior National Team at 1965 Madeka". indiafootball.de. IndiaFootabll. Retrieved 30 September 2018. ^ "The senior National Team at 1966 Maderka". indiafootball.de. IndiaFootabll. Retrieved 30 September 2018. ^ "The senior National Team at 1968 Asian CUPQ". indiafootball.de. IndiaFootabll. Retrieved 30 September 2018. ^ "The senior National Team at 1968 maderka". indiafootball.de. IndiaFootabll. Retrieved 30 September 2018. ^ "The senior National Team at 1969 maderka". indiafootball.de. IndiaFootabll. Retrieved 30 September 2018. ^ "The senior National Team at 1970 maderka". indiafootball.de. IndiaFootabll. Retrieved 30 September 2018. ^ "The senior National Team at 1972 maderka". indiafootball.de. IndiaFootabll. Retrieved 30 September 2018. ^ "The senior National Team at 1974 AG". indiafootball.de. IndiaFootabll. Retrieved 30 September 2018. ^ a b c "Know your Indian Football Heroes: PK Banerjee". sportskeeda.com. Sportskeeda. Retrieved 13 October 2018. ^ "The senior National Team at 1976 Jasson". indiafootball.de. IndiaFootabll. Retrieved 30 September 2018. ^ "The senior National Team at 1977 kingscup". indiafootball.de. IndiaFootabll. Retrieved 30 September 2018. ^ "The senior National Team at 1977 Prescup". indiafootball.de. IndiaFootabll. Retrieved 30 September 2018. ^ "The senior National Team at 1978 AG". indiafootball.de. IndiaFootabll. Retrieved 30 September 2018. ^ "The senior National Team at 1980 OLY Q". indiafootball.de. IndiaFootabll. Retrieved 30 September 2018. ^ "1982 Maderka Result". indiafootball.de. IndiaFootball. Retrieved 30 September 2018. ^ "1982 Asian games result". indiafootball.de. IndiaFootball. Retrieved 30 September 2018. ^ "Coach Bob Bootland dies". archive.indianexpress.com. The IndianExpress. Retrieved 30 September 2018. ^ "MAGPIES TURN TO KINNEAR". web.archive.org. FOOTBALL365. Retrieved 30 September 2018. ^ "A Bible for soccer lovers". tribuneindia.com. TheTribune. Retrieved 30 September 2018. ^ a b c "The Agony of Syed Nayeemuddin". sportskeeda.com. Sportskeeda. Retrieved 12 October 2018. ^ "The Indian Senior Team at 1987 Nehru Cup". indianfootball.de. IndianFootball. Retrieved 12 October 2018. ^ "The Indian Senior team at 1989 Nehru Cup". indianfootball.de. IndianFootball. Retrieved 12 October 2018. ^ "The Indian Senior team at 1991 Nehru cup". indianfootball.de. IndianFootball.de. Retrieved 12 October 2018. ^ "The Indian Senior team at 1992 Asian Cup". indianfootball.de. IndianFootball. Retrieved 12 October 2018. ^ "The Indian Senior team at 1993 nehru cup". indianfootball.de. IndianFootball. Retrieved 12 October 2018. ^ "The Indian Senior team at 1994 WC qualifier". indianfootball.de. IndianFootball. Retrieved 12 October 2018. ^ "The Indian Senior team at 1993 saarc cup". indianfootball.de. IndianFootball. Retrieved 12 October 2018. ^ "The Indian Senior team at 1994 rajiv gandhi cup". indianfootball.de. IndianFootball. Retrieved 12 October 2018. ^ "The Indian Senior team at 1995 nehru cup". indianfootball.de. IndianFootball. Retrieved 12 October 2018. ^ "The Indian Senior team at 1999 safgames". indianfootball.de. IndianFootball. Retrieved 12 October 2018. ^ "The Indian Senior team at 2011 M.cup". indianfootball.de. IndianFootball. Retrieved 12 October 2018. ^ Roach, Stuart. "Constantine's rising stock". bbc.co.uk. BBC. Retrieved 13 October 2018. ^ a b "The Indian Senior team 2005 coach appointment". indianfootball.de. IndianFootball. Retrieved 12 October 2018. ^ "The Indian Senior team at 2005 pak tour". indianfootball.de. IndianFootball. Retrieved 12 October 2018. ^ "The Indian Senior team at 2005 fiji tour". indianfootball.de. IndianFootball. Retrieved 12 October 2018. ^ "Houghton's tenure as Indian football coach over: sources". timesofindia.indiatimes.com. TOI. Retrieved 13 October 2018. ^ "Houghton resigns as national coach - AIFF trying hard to change bob's mind". telegraphindia.com. Telegraph India. Retrieved 13 October 2018. ^ "ewly appointed coach of the Indian football team". timesofindia.indiatimes.com. TOI. Retrieved 13 October 2018. ^ "Savio should've taken over from Houghton:". timesofindia.indiatimes.com. TOI. Retrieved 13 October 2018. ^ "Savio Madeira stamps his authority on SAFF cup win". sportskeeda.com. Sportskeeda. Retrieved 13 October 2018. ^ "Wim Koevermans appointed as new Indian football coach". timesofindia.indiatimes.com. TOI. Retrieved 13 October 2018. ^ "Indian national football team coach Wim Koevermans resigns". sportskeeda.com. Sportskeeda. Retrieved 13 October 2018. ^ "Stephen Constantine resigns as India coach after Asian Cup exit". indianexpress.com. Indianexpress. Retrieved 14 January 2019. ^ "CONSTANTINE ANNOUNCES LIST OF 23 FOR AFC ASIAN CUP". the-aiff.com. AIFF. Retrieved 27 December 2018. ^ a b c "Award winning Indian footballer". indianfootball.de. IndianFootball. Retrieved 13 October 2018. ^ "GOSTHO PAL - THE GREAT WALL OF CHINA - GREAT ICON OF KOLKATA FOOTBALL". Retrieved 20 August 2018. ^ "LEGENDS OF INDIAN FOOTBALL : GOSTHA PAL". Retrieved 20 August 2018. ^ "1938 Indian Tour of Australia". ozfootball.net. Australian Online Football Museum. Retrieved 24 September 2018. ^ Greg Stock, Thomas Esamie,John Punshon. "Socceroo Internationals for 1938". ozfootball.net. OZfootball. Retrieved 24 September 2018. ^ "Talimenren Ao achievements". kolkatafootball.com. Kolkata Football. Retrieved 2 November 2018. ^ "Remembering a Naga doctor-footballer who led India in the 1948 Olympics". scroll.in. The Scroll. Retrieved 2 November 2018. ^ "Story of a legend – Dr. T. Ao the first Naga Olympian and football genius". thenagarepublic.com. The Naga Republic. Retrieved 2 November 2018. ^ a b c d "AIFF Condoles Sailen Manna's death". www.the-aiff.com. AIFF. Retrieved 6 November 2018. ^ "A natural leader". sportstarlive.com. Sports Star. Retrieved 6 November 2018. ^ "Remembering India's most prolific centre forward - Sahoo Mewalal". sportskeeda.com. SportsKeeda. Retrieved 20 November 2018. ^ "Legend of Indian football:Sheoo Mewalal". thehardtackle.com. The Hard Tackle. Retrieved 20 November 2018. ^ "India Senior team 1952 Quadrangular Cup". indianfootball.de. Indian Football. Retrieved 20 November 2018. ^ "India Football Hall of Fame, Neville D'Souza". indianfootball.de. Indian Football. Retrieved 20 November 2018. ^ "Match Report Australia - India". www.fifa.com. FIFA. Retrieved 20 November 2018. ^ "Olympics 1956 Statistics". www.fifa.com. FIFA. Retrieved 20 November 2018. ^ "Chuni Goswami: A legend in every sense of the word". theweek.in. The Week. Retrieved 22 November 2018. ^ "Indian Football Legends". kolkatafootball.com. Kolkata Football. Retrieved 22 November 2018. ^ a b "IFFHS' Players and Keepers of the Century for many countries". rsssf.com. RSSSF. Retrieved 12 November 2018. ^ "FIFA award for Banerjee". thehindu.com. The Hindu. Retrieved 12 November 2018. ^ "PK Banerjee gets FIFA Centennial Order of Merit awards". outlookindia.com. The Outlook India. Retrieved 12 November 2018. ^ "1970 Asian Games Bronze Medallist and former India number one Bandya Kakade passes away". goal.com. Goal. Retrieved 22 November 2018. ^ "Invalappil Mani Vijayan - Goals in International Matches". rsssf.com. RSSSF. Retrieved 22 November 2018. ^ "Baichung Bhutia Biography". www.mapsofindia.com. Maps of India. Retrieved 25 November 2018. ^ "Bhaichung Bhutia-Inspirational leader both on and off the field". thehindu.com. The Hindu. Retrieved 25 November 2018. ^ "Bhutia brings down the curtain on his international career". thehindu.com. The Hindu. Retrieved 25 November 2018. ^ "Bhaichung Bhutia Retires From International Football At The Age Of 34". goal.com. Goal.Com. Retrieved 25 November 2018. ^ "IFFHS ANNOUNCE THE 48 FOOTBALL LEGEND PLAYERS". iffhs.com. IFFHS. Retrieved 19 February 2019. ^ "Sunil Chhetri 100th Match: Wishes Pour In, From Sachin Tendulkar, Virender Sehwag And Many More". ndtv.com. NDTV. Retrieved 15 January 2019. ^ "Sunil Chhetri Overtakes Lionel Messi With Second-Highest International Goals Among Active Players". ndtv.com. NDTV. Retrieved 15 January 2019. ^ "Chhetri stars as India wins". The Hindu. 14 August 2008. Retrieved 15 July 2018. ^ "Sunil Chetri's hat-trick sinks Vietnam". The Hindu. 9 October 2010. Retrieved 15 July 2018. ^ "Chhetri helps himself to a triple-strike". The Hindu. 2 June 2018. Retrieved 15 July 2018. ^ a b c d Choudhury, Chandrahas (11 June 2014). "Blame India's World Cup Drought on the Shoes". Bloomberg. Retrieved 30 May 2016. ^ a b "The Indian National Team's World Cup qualifying:". Indianfootball.de. Archived from the original on 14 June 2010. ^ "India's performances at the AFC Asian Cup". goal.com. GOAL. Retrieved 28 September 2018. ^ a b "Asian Nations Cup 1964". RSSSF. ^ "Asian Nations Cup 1984". rsssf.com. RSSSF. Retrieved 14 January 2019. ^ "Asian Nations Cup 2011". rsssf.com. RSSSF. Retrieved 14 January 2019. ^ "Yugoslavia 10-1 India". RSSSF. ^ a b "Olympics 1956". RSSSF. Wikimedia Commons has media related to India national association football team.